The definitive The Legend of Zelda hardcover book! Read the full history of Hyrule, the official chronology of the games, and more. Introduction by Nintendo mastermind Shigeru Miyamoto. Includes an exclusive comic by the creator of the Zelda manga, Akira Himekawa! 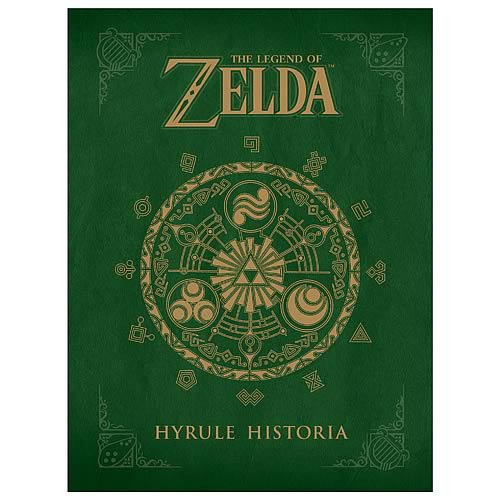 Dark Horse and Nintendo bring you this Legend of Zelda: Hyrule Historia Hardcover Book, an unparalleled collection of historical information on the video game series The Legend of Zelda. This handsome hardcover includes never-before-seen concept art, the full history of Hyrule, the official chronology of the games, and much more! Starting with an insightful introduction by Shigeru Miyamoto, the legendary producer and video game designer of Donkey Kong, Mario, and The Legend of Zelda, this book is crammed full of the storied history of Link's adventures as told by the creators themselves. As a bonus, it includes an exclusive comic by the foremost creator of The Legend of Zelda manga - Akira Himekawa! This 248-page Zelda volume measures 12-inches tall x 9-inches wide. Ages 8 and up.